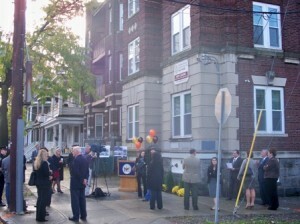 Albany, NY – Officials from the Capitalize Albany Corporation, joined developers Lou Chicatelli and Chris Maddalone, Mayor Jennings, KeyBank, and local residents to celebrate the opening of a newly renovated apartment building in Albany’s Park South neighborhood. The unveiling of this renovation project is a particular victory for the neighborhood in light of the history of the building. In 2008, the City of Albany facilitated the sale of the seventy year old property from a former absentee landlord to Morris Street Development LLC, owned by Lou Chicatelli and Chris Maddalone. This was one of the first triumphs for the City’s vacant building court, established in 2008 to combat neglectful property activity. The former owner had allowed the building to deteriorate until it became a safety hazard, and required the City to institute a costly 24-hour code watch. The former building owner did not comply with requirements and chose to sell the property. Shortly after, Morris Street Development LLC acquired the building and began a total rehabilitation. To assist with project financing, the developers Lou Chicatelli and Chris Maddalone worked with KeyBank and the Capitalize Albany Corporation for lending. The project also went through the City’s Industrial Development Agency to help with project development costs, including real property tax incentives. With renovation projects happening in other parts of the neighborhood, including Knox Street and further up Morris Street, the building at the corner of Morris and Knox Street was a prime location for redevelopment. This particular building had been a neighborhood nuisance for many years drawing repeated code violations for neglect. The situation came to a head in 2008 when the mortar on the façade became so deteriorated that bricks were falling onto the street posing a hazard to pedestrians. This triggered the City’s emergency 24-hour watch. Due to the significant investment required for a project like this, the developers worked with the City and the Capitalize Albany Corporation to structure the redevelopment financing in a way that made it viable. After two years, and $865,000 in investment, the project was completed under budget and ahead of scheduled completion. With help from the City of Albany Industrial Development Agency, the Community Preservation Corporation, and the Capitalize Albany Corporation, this formerly abandoned building is now home to nine high quality apartments.